These days it seems like the only hot-selling item at Staples is the company's giant store eraser. The office supplies chain revealed plans Wednesday to shut an additional 30 stores this year, accelerating its ongoing efforts to slash costs. These store closures would be in addition to the 140 already announced. Wall Street loves Staples' (SPLS) plans to shrink itself because it's been great for the bottom line. Just look at the third quarter. While sales shrank during the last three months, profits surged 61% and exceeded what investors had been hoping for. Staples shares bounced over 10% Wednesday morning on the numbers. "People want as many store closures as fast as possible," said David Strasser, an analyst who covers the company at Janney Montgomery Scott. 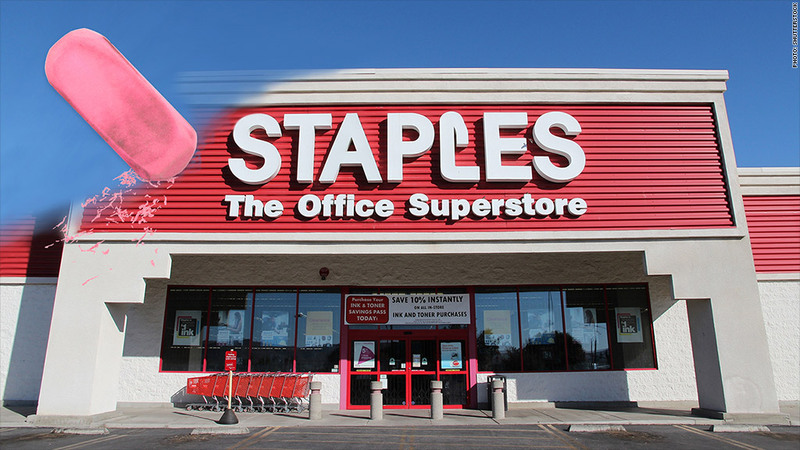 Say goodbye to 170 stores: Staples and rivals like Office Depot (ODP) have been shutting stores due to fierce competition online and lower demand for their products. Staples said it has eliminated $200 million of annual expenses and it's not even halfway to its goal. Strasser said store closures have allowed Staples to trim its rent costs by $25 million so far this year. Now Staples plans to turn off the lights on 170 stores in North America this year. That reinvention includes plans to try out the mini-store model, which has been championed by Best Buy (BBY). Basically, companies like Microsoft (MSFT) and Samsung pay Best Buy to show off their products in a devoted section of the store. Now Staples plans to test out a similar mini-store model to show off tech as well as furniture products, the company said during a call Wednesday with analysts. More obstacles ahead: But Staples has to do more to win over investors and analysts alike going forward. While its shares are way off their lows of the year, they're still down about 13% in 2014. 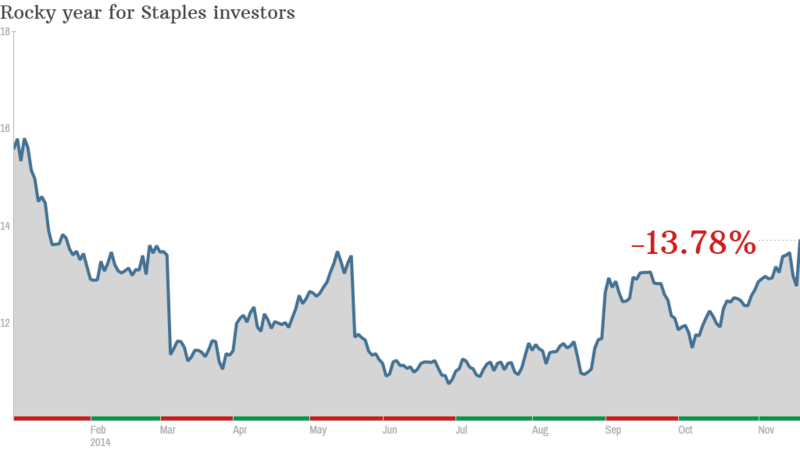 Just 5% of the analysts who cover Staples have buy ratings on the stock. That's a very low percentage, especially considering analysts tend to be a pretty optimistic bunch. Staples also faces other headwinds. In a regulatory filing, the company warned it may suffer losses connected to a possible data breach that was first disclosed in October. Staples said it has "identified and eradicated" the malware used in the incident, but it's too early to estimate the expenses tied to the incident.